To the untrained eye, including many of us who grew up seeing annual photos of Soviet military hardware being paraded in Red Square, this could be an image from the 1960s. 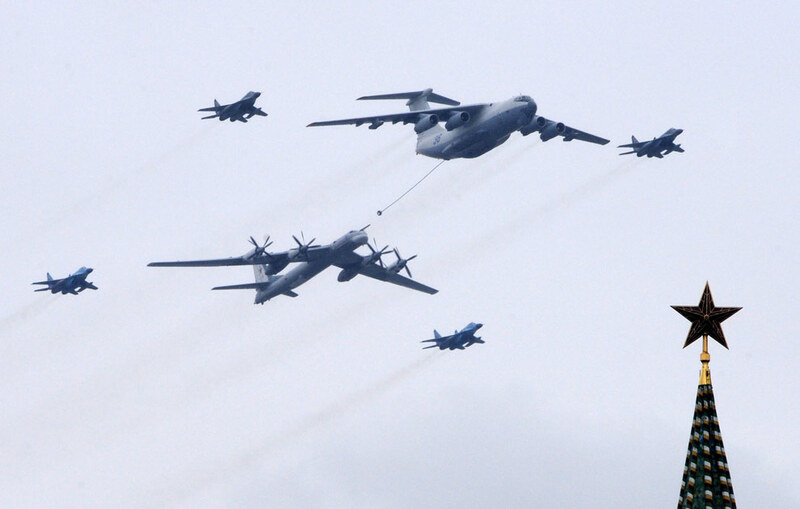 The planes are flying over Red Square for the annual photo-op that the Soviet–oops, Russian–government provides each year to commemorate the end of WW II. A slide show at The Big Picture provides this and other photographs, many of which are picture-perfect renditions of typical images from the Cold War: massed soldiers tightly entrained as they pass the reviewing stand, and huge missile launchers, tanks, and other lethal vehicles passing in front of ornate, 19th century buildings. Russian might is on display–as the massive, industrialized concentration of disciplined masses serving an ancient authoritarian state. That is one Russia, and perhaps one that still should be taken seriously, but other images provide evidence that the world is changing around the government’s stage. One photograph features a young couple kissing as they walk in parallel to the parade, indifferent to the public show providing a backdrop for their personal relationship. In another, the photo of the weaponry includes a TV crew, suggesting that the military is becoming relegated to a sideshow in the information age. In another, a young boy runs past a memorial, his brand-name athletic clothing and free spirit an obvious contrast to the stolid monumentalism of the national security state. The photographers seem to be saying that the parade comes out of the past, while the spectators are the future. 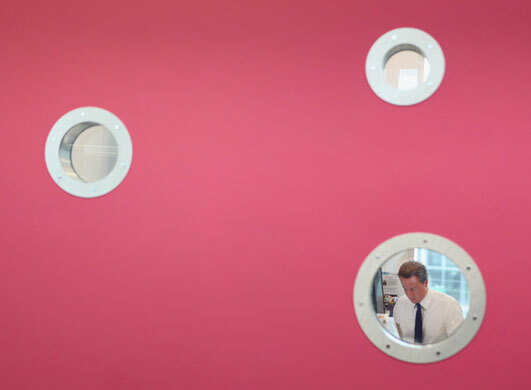 This photo offers a peek into Digilab at the Open University in the UK. The Guardian’s caption mentioned that the individual shown was working at a computer–as if that were something very special. To cut to the chase, this is another example of Cold War image culture. The public is given a glimpse of a technocratic elite who work in highly modern workplaces that are carefully guarded against more intrusive public access. The image itself is of an interface: the small, circular, specially sealed windows could almost double as gauges, or lights, or conduits for optical beams, or ports for flexible hoses. The flat, monochrome surface with its odd, supposedly pleasant color completes the composition. This is a world of uniformly managed surfaces to maintain a supposedly rational distribution of skills and risks. In other words, Cold War imagery continues to be produced on both sides of the former iron curtain. And in each case the images can continue to legitimate different versions of the old dispensations. It wasn’t all bad, but I certainly hope that we can move on to better things. With that in mind, I find this last image particularly poignant. 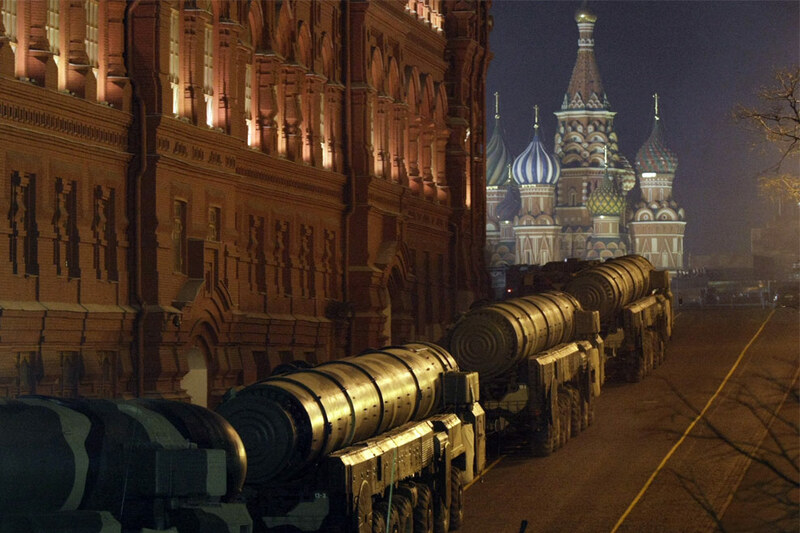 Missile launchers are waiting their cue to enter the Square for a rehearsal for the Victory Day parade. The golden cannisters could be something completely different than weapons, and they could be to any scale–say, a child’s toys. The domed cathedral in the background looms Oz-like in the fog. The vehicles and the buildings each seem to have their own source of light, and their own secret purpose. The entire scene is dream-like. As if the whole era had been a dream, a fantastical dream of beauty and terror, and one that you can’t quite get out of your head. Photographs by Natalia Kolesnikova/AFP-Getty Images, Peter Macdiarmid/Getty Images, Ivan Sekretarev/Associated Press.